As some of you may be aware, Blender 2.49 is old unsupported software that is becoming increasingly less usable on modern computers. To make matters worse, authors have large projects that are currently stuck on this platform, jeopardizing their work! We are creating a 2.49 XPlane2Blender converter inside of XPlane2Blender 2.7x, so that opening a 2.49 Blend file in 2.7x will automatically convert meshes, animations, materials, lights, textures, and XPlane2Blender properties into a modern format. This isn’t just an idea, we currently have a strong proof of concept that animations can be converted from old to new! That if it exports in 2.49, it exports in 2.7x as similarly as possible. That the conversion process is hassle free and also transparent. That your work is safe and won’t be lost if there is a problem. To accomplish this we’re going to need a lot of test .blend files and projects – to make it work for artists in the wild we need projects in the wild! We’ll take anything working and not working. All source files will be kept secure and confidential within Laminar Research, and only used for this feature of XPlane2Blender, unless you make it open source. Given that we’re trying to convert EVERYTHING, including materials and textures, it would also be extremely nice to have all files referenced as well. Any description you’d like to include (preferably in a text block) would be nice too. Again, just as with any other time someone sends me a sample to debug, it is kept secure and private, kept only for as long as needed, you can ask me to delete it at any time, and is only used for the development of that specific bug or feature of XPlane2Blender. They would never be used to develop any Laminar Research asset. If you’re willing to submit a project to me, please get in contact via e-mail, DM, comment, or especially Github bug #397. A constant request for XPlane2Blender and other exporters maintained by Laminar Research is an import OBJ feature. So, one last time, here is the news: by now an importer is basically never going to be a part of XPlane2Blender, but it could be its own project! It could take years of development to make it very well polished, however. There are a few projects started on the forums you can checkout if you’d like! Why Is This Such A Hard Problem? It is simple to read the vertex table, attributes, animation keyframe table, and turn that into Blender data, some projects can already do this, in fact. The trouble is getting the exact or nearly the exact .blend file back. If the OBJ was produced with comments and correct indentation, you might be able to get some of these things back (likely just a few names.) A large complex Blend file without this stuff is a nightmare of an unorganized mess and would make the rest of the manual reverse engineering process even harder. If A.blend, B.blend, and C.blend can produce the same OBJ, which one should the OBJ be reversed engineered back into? The relationship between XPlane2Blender settings and what appears in the OBJ can be very esoteric and there is not always a 1:1 relationship. Some ATTR_s only appear when certain combinations of settings are used. You may find there are absolutely no good defaults. In order to perfectly solve these ambiguities and produce .blend files that are similar to what originally exporter the OBJ file, it would be incredibly useful to know about the behavior of the exporter that exported the OBJ in question. This means an importer would need to know all the bugs and features of every exporter, and we don’t even know that after developing the exporter. Bugs are waiting to be discovered, or used by artists until they have to be turned into a feature. Our exporter currently struggles to take into account past bugs, and that’s the exporter! This turns into it’s own ambiguities to solve: “Is this OBJ’s mention of deprecated ATTR_s a choice the artist made. despite the deprecation warning, or was it a bug that this was still getting written, or was this OBJ written before it was deprecated?” Now you’re messing not only with valid or not, but what the OBJ is supposed to look like. Now you will have even less information or, now, seemingly incorrect information! OBJs are meant for X-Plane, not humans. As such exporters can take many liberties with the content of OBJs as long as they match what the artist meant. This can result in very complex optimizations that might even break our own guidelines, all to deliver the best (and deliver on time) to the consumer and our artists. This makes developing an importer that reproduces the importer OBJ, either exactly or simply visually matching (let alone animated or textured properly) even harder. In a raw .blend file, objects are like Lego bricks which get baked into one solid piece. Going in reverse will likely not get the same neat separation. Blender is not smart enough to tell what is a wing shape, what is a wheel shape, what is a throttle level shape. It may be impossible to separate the vertices back into these distinct meshes (especially after optimizations)! Making a “really smart” importer that is shape aware is a brutally hard algorithm that the world’s best computer scientists are still attempting to solve. It may not be challenge you want to take on. We May Build A Reasonable Importer One Day! With all these challenges, an importer would have to be willing to not handle all edge cases and not attempt to reverse engineer an OBJ back to the exact .blend file that made it. For instance, a 3 year old OBJ would not be reversed engineered into the .blend file that produced it 3 years ago, especially since an artist would want to then update their assets anyway! Having art assets “marooned” on other exporters or “dead” is a pretty terrible waste of time, likely be more painful than hand fixing all lot of little things. As Ben pointed out “If we can’t make a direct import [.skp->.blend, .ac->.blend] path, OBJ import is the least bad option. A 2.49 converter is a much more manageable project (far on the back-burner.) The complexity of this tool is much more manageable, because the 2.49 is not in active development and you are converting .blend to .blend, not .obj to .blend. Blender to Blender is something which Blender is already very good at. For airplane authors, the biggest question VR brings up is: what do I have to do to my aircraft to make this work? This is the first of three posts explaining not only how manipulation works with VR, but why we made our decisions and how we got here. Bear with me – this will end with specific recommendations for what to do with your aircraft. Old-timers like me will remember that when the 3-d cockpit first came out, almost all of the “brains” of it were powered by clicking on the 2-d panel, which was “mapped” to the 3-d cockpit. X-Plane would find out where your mouse click intersected the 3-d cockpit, find the texture location on that triangle, and map that back to the 2-d panel. This seemed pretty cool when it came out 15 years ago, but as authors started making more sophisticated 3-d cockpits, it became clear that we needed a way to specify how the mouse worked directly with the 3-d cockpit shape, because the mapping back to the 2-d wouldn’t allow the user to do basic things like dragging a throttle. Thus in X-Plane 9 we added the first set of manipulators – tags on the 3-d mesh of a cockpit specifying what happens when the user clicks on it. The manipulator could specify a dataref to modify, a command to actuate, and some data about what kind of mouse click operation was happening. The key words here are mouse click. The original manipulators were designed entirely in terms of a mouse on a 2-d screen; they were designed to be exactly as powerful as a 2-d panel system, which was of coarse also totally mouse-centric. The relationship between the generic instruments and the original manipulators is pretty tight. The good part of the original manipulator system was that it was very flexible – mouse-centric handlers were a low level tool around which authors could do whatever they wanted. The down-side of this design was that mouse-centric handlers were a low level tool around which authors could do whatever we want. We examined our own default fleet of a dozen or so aircraft and found that no two aircraft’s cockpits operated the same way, and almost all of them had at least some aspect that was hard to use – a poor manipulator choice for the job. Knobs were, in particular, quite difficult – the original 2-d panel system used click-and-hold over a knob to actuate it, but authors working in 3-d had often used drag actions to do knobs, and the drag actions would respond differently depending on camera angle. We received approximately 8,452,124 bug reports that the knobs in the 747 were hard to use specifically because of this. The 2-d axis manipulator (ATTR_manip_drag_xy) specifies what happens when the mouse moves up-down and left-right, relative to the screen. What on earth does that mean in VR? Even if we made something that tracks up-down and left-right relative to the screens of the HMD, the results would be completely weird because the “thing” in the cockpit would not move the way your hand was moving. With a mouse, a mis-match between mouse and aircraft isn’t surprising, but in VR, it’s weird to reach out and touch something and have it behave the wrong way. The knob manipulator. It describes a knob that does things when turned clockwise or counter-clockwise. This is pretty easy to deal with – you click it with your controller and turn your wrist clock-wise or counter-clockwise and it turns. Because we know what the mechanism is (and not just what the mouse should do) we can make a good decision about how to handle this manipulator in VR. As it turns out, we ran into this problem of not doing what to do with the mouse, and needing to know what the mechanism was before we even started looking at VR. The exact same problem (“I want to touch the 3-d cockpit as if it was a thing and have it respond in the expected way”) exists in VR and on X-Plane Mobile! 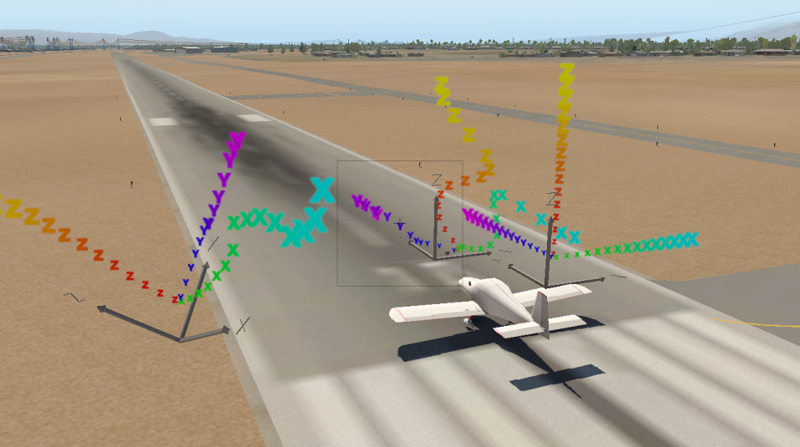 Because X-Plane mobile runs on a touch screen and you have your physical finger on a switch, there are a lot of cases where the switch has to track really well and work the right way. If the switch goes up and down, you want to flick your finger up to turn the switch on; if it goes left-right you want to flick left and right, and anything else is astonishing. So X-Plane mobile set us on this path toward mechanism-based manipulators, and VR further drove us in that direction, since both have the same physical, non-mouse environment where a user directly interacts with the 3-d cockpit. So as an author, what should you do when working on a 3-d cockpit? My answer is: use some of the manipulators, but not others, to model the way things work in 3-d. These manipulators are the best way to create certain physical mechanisms – use them every time this case applies to your aircraft. ATTR_manip_drag_axis. Use this for a physical mechanism that slides along a linear path, like the throttle handle of a Cessna. ATTR_manip_noop. Use this to make a manipulator that blocks the mechanism behind it from being touched, e.g. the safety guard plate over a switch. ATTR_manip_command. Use this for push buttons that actuate momentarily while a button is held down, like a button to motor a starter that you push in and hold down. ATTR_manip_command_knob, ATTR_manip_command_switch_up_down, ATTR_manip_command_switch_left_right. Use these for knobs and switches with 3 or more positions that rotate or move. Pick the right manipulator for the mechanism! ATTR_manip_axis_knob, ATTR_manip_axis_switch_up_down, ATTR_manip_axis_switch_left_right. These provide an alternative to the above manipulators when you must use a dataref. We recommend commands over datarefs any time you have a choice; the command system provides better interoperability between custom plugins, custom aircraft, and custom hardware. ATTR_manip_command_switch_left_right2, ATTR_manip_command_switch_up_down2, ATTR_manip_command_knob2. Use these for knobs and switches with exactly two positions. You can use these to get a simple click-to-toggle with the mouse (quicker and easier for mouse users) while getting real 3-d movement in VR. These manipulators are not perfect fits with physical motions and may require tweaking for VR, but they’re the best options we have now for certain problems. Try to use something from the always list instead if you can. Do not use these manipulators if the mechanism you are simulating matches something from the list above. ATTR_manip_drag_xy. This is the only 2-axis drag we have, and is the best choice for eye-ball vents and the yoke. The yoke is special-cased in VR and should be based off of a 2-d xy manipulator. We are looking into more powerful multi-dimensional manipulation in VR, but this work won’t be complete for 10.20. ATTR_manip_command_axis. This manipulator runs a command once based on moving a lever down or up. You should probably use a drag axis or command up-down switch, but there may be some odd mechanisms in aircraft where this manipulator is a good fit. It should not be your first-choice go-to manipulator. ATTR_manip_push, ATTR_manip_radio, ATTR_manip_toggle. These manipulators can serve as alternatives for push-button style controls when you absolutely have to write to a dataref and not use a command. WARNING: Do not ever use these manipulators for things that move, e.g. don’t use these for banana switches, spinning knobs, or things like that. These manipulators were for mouse-centric movement and should be replaced with knob or switch manipulators. ATTR_manip_delta, ATTR_manip_wrap. These were designed to simulate knobs by click-and-hold – use the knob manipulators instead. ATTR_manip_drag_axis_pix. This was designed to simulate a knob by click-and-drag – use the knob manipulators instead. There is a clear design in the plugin system for changing a command’s behavior. So a third party aircraft can easily “take over” the existing engine start command. This is very, very difficult to accomplish via datarefs. Commands can be mapped to sound to capture the act of the user “doing” the thing, regardless of whether it works. For example, if you want the click of the starter switch regardless of whether the starter motor engages (maybe the battery is dead), commands make this easy to do. Often there is no dataref for ‘the user is trying but it’s not working’. In X-Plane 11 we’ve been moving to commands to get our planes ready for VR, the new manipulators, and FMOD sound all at once. In the next post I’ll cover some of the issues specific to VR and the 3-d cockpit. 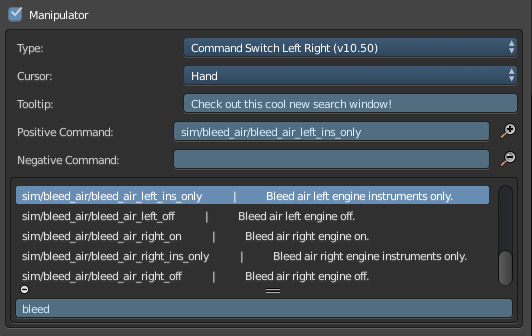 * Developers who write plugins that provide external interfaces to X-Plane: make sure you have a way to provide access to commands and not just datarefs! There are things you can do only with commands and not datarefs. Autocorrecting spot lights – the light points where you point it, not where the parameters tell it to go! Enhanced build number and plugin history to help debug files and track update problems. After installing this rc.1 version, your scene settings should look like this. The green check mark means “most safe” to use. Though unsupported and largely irrelevant to most authors, a “Plugin Development” section has been added with some neat tools that you probably shouldn’t use. We could not have gotten this far without the incredible support of our beta testers, new authors, bug reporters, and all the wonderful artists who give us the inspiration and energy to make this product better! It has been an incredible journey diving into this facet of the community and I look forward to even more releases, including VR manipulators, full WYSIWYG lights, and more! I hate finding out about these kinds of bugs late in the beta. But this one was pretty big. Non-metal: diffuse light is tinted by the albedo texture. Specular light is not tinted. Metal: there is never diffuse light. Specular light is tinted by the albedo texture. In other words, since metals don’t have a diffuse component, we recycle the albedo to save texture space. The bug in 11.05 is that for a pure metal, the albedo was tinting ambient light but not the sun itself. A third party developer sent me a test model that showed the problem – here’s the before and after. 11.05 – sun spot is white. 11.10 – sun spot is red. That weird set of colors on the top of the helicopter body is due to the white sunlight being added to the red body. The red aircraft body is lit by ambient light reflected directly off of the environment. The runway stripes are not visible because the metal is about 30% rough, diffusing the reflection. Alex and I took a look at some of our legacy aircraft and found that fixing the lighting didn’t make too much of a difference for metals that are not tinted. Approximations of metals with complex spectrum-dependent fresnel like gold. Composite paint, e.g. like for your car, with fleks of metal and translucent dielectric polymer mixed together – that’s the case where this really helps. As I wrote this up I realized that the spot lights are still wrong in beta 8 – they’ll be fixed for RC1 unless people really need the old model, in which case we’ll have to put some versioning in. My guess though is that anyone doing composite paint realized it was impossible in 11.05 and hasn’t shipped anything like that yet. In these comparisons we are under an airport light viewing various materials. In the multi-color case the bottom row of materials are various “metals” with light tinting to simulate copper, iron, gold, etc. In the second set of cases (all red) we have a 2-d grid: metal on the bottom, dialectric on top and rough on the left and glossy on the irght. Note that the reflection of the overhead light is reddish for the metals and white for the plastics in 11.10 (correct) but all white in 11.05 (incorrect).